I have so much to do today but little energy with which to do it. I’ve been struggling with a bit of insomnia and it hangs heavy on my back like buckets of water swinging from a yoke. Our last holiday gathering of the year is tomorrow, so you know that fudge I’m to bring and the other dessert, as well as gifts to wrap and odds and ends of traveling? They are all sort of heaped in a mental pile by the door, beckoning. My husband is off to work early, with promises of getting a new cellphone for me. I’m leaving Apple behind, one lonely bite in its forlorn side. I’m the only lone Apple customer in my family and for ease, I’m switching. I’m hoping I just get a simple layout with a good camera. We’ve already visited with an uncle who happened by, swiped clean the breakfast table of its bagel remnants and granola bits, and I enjoyed a strange, but entertaining story, wearily sinking into the quilts and comfort of my bed. Our school holiday ends on Monday, and I think all of us had a wonderful, for-the-most-part, restful time this year, for which I’m truly thankful. I think fondly of the stories, Advent readings, and poem we enjoyed. We had a little advent calendar from the grocery store, the children taking turns, finding darling chocolate shapes within. We also shared Tasha Tudor’s Advent calendar in her A Book of Christmas and were thoroughly charmed by the darling pictures she painted. The children enjoyed frosting and decorating cookies for various parties and it worked well to do it slowly and in a couple of days. I loved keeping the rush as low as possible, so we could hear the seasonal hush. We enjoyed feasting together as a family, red candles lit, and just more games, movies, and laughter. Oh and the Christmas music. James Galloway and Bing Crosby being favorites. Even chores weren’t the same, with a pine scent lingering in the air, and cinnamon rolls after coming in after feeding animals. The beauty of the season is definitely still hanging about and it’s really only the 11th day of Christmas. I held out for as long as I could on getting a Christmas tree and I’m so glad I did! We found an off-the-beaten track Christmas tree farm and they had some left just for us to choose from. It was a lovely time, excitement high because it was so close to Christmas and the sparkle of it all hadn’t worn off yet. We were given fresh-popped popcorn and hot chocolate, and my husband and oldest son ratchet-strapped the tree tightly to the top of the mini-van. We may have seemed behind or late, but truly getting the tree later in December has made it all the more special now. It’s standing tall and beautiful right now…most of it’s needles soft and scent fresh. I think the most special thing has been the few meaningful conversations I have had with a few children or over an Advent reading. We didn’t do all that I wanted, but what we did read and talk about really was special. The children really stepped into their own spirit of gift-giving this year, making or using their own money to buy others things. I didn’t do or make them do that at all, but it was its own special gift to me. The sun is glaring against the piles of snow, and I’m so grateful for its blinding brightness. Carries one through the immense, long gray days of this time of year, does it not? Even our New Year’s Eve ended in a special way, all of us home, singing and sipping sparkling Apple Cider at midnight! We’ve never done that before and it was special. Sigh and back to the present, I hope to make some turkey and veggie soup later, Thanksgiving Tom still giving a month later, and some of the children may go to a homeschool gym night with my father-in-law. Oh, but wait, it’s actually lunch time and I haven’t yet put anything on the table! Time to stop typing and heat up some leftovers for lunch, maybe with a side of piping hot grilled cheese. I’m so thankful for another year of celebrating the Savior’s birth and for the small moments that make His love truly tangible. Off to fix lunch! A child’s wisdom include incredible curiosity, which denotes his essential humility. While adults sometimes hesitate to say “I don’t know” for fear they will be thought ignorant or stupid, a little child has no such silly inhibitions. Without a false sense of shame he pours forth his questions -“Why?” “What for?” “When?” “Where?” “Why?” Before their minds become biased by adults, children are open-minded, welcoming all truth concerning the world around them…Children know how to derive happiness from little things. They delight in little sparks of gladness and do not demand that every hour be flooded with unremitting pleasantness. This is wisdom of a high order, and the lesson is one of the best gifts children offer the world. 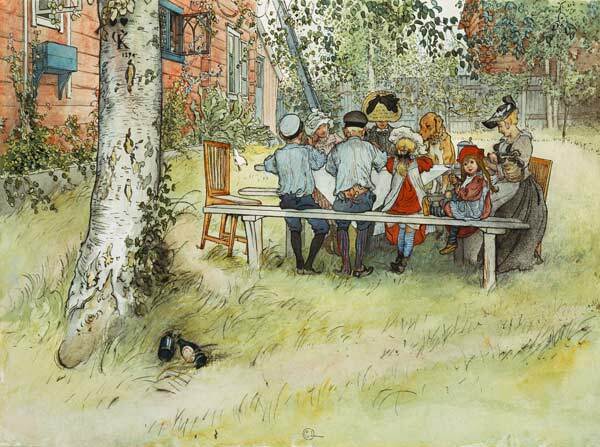 *Painting by Elsa Beskow and all rights reserved to artist.